“ MY INTERNSHIP DIDN'T BECOME MY JOB, IT BECAME MY PASSION!" Gil is an ultra motivated youngster who was not afraid to show it. He did his first internship in a retail agency and then joined 20Something: an advertising agency specialised in the newest generations. He had a rough start but he committed 100% to evolve and showed what he was worth creatively. "I was fortunate enough to have real responsibilities and to work on real briefings, this allowed me to mature professionally but also personally. Doing an internship is a win-win between the intern and the company: you're surrounded by real professionals who transmit their know-how and you get the chance to prove yourself in return. Prove them that we deserve the opportunity!" "THANKS TO MY INTERNSHIP, I REALIZED SUSTAINABILITY AND FASHION ARE FAR REMOVED FROM EACH OTHER. MY DREAM IS TO GATHER THESE TWO." Stan is a cheerful and driven young man who values sustainable development. During his internship at IVOC, he was introduced in the Belgian Fashion/Confection Industry. Independent and firm, he worked on his final paper ‘MVO in the confection’. The many conversations with CEO’s and CSR-managers, made him realize that the Fashion Industry still has a long way to go. After his internship and graduation from ‘Bachelor Modetechnologie’, he decided to explore this issues to the bottom and he started studying ‘Milieumanagement’. This to make his dream come true. Stien is a happy, motivated person who likes variety and challenge in her job. She is one of the happy few who could start working immediately after her internship in the company Marylise. 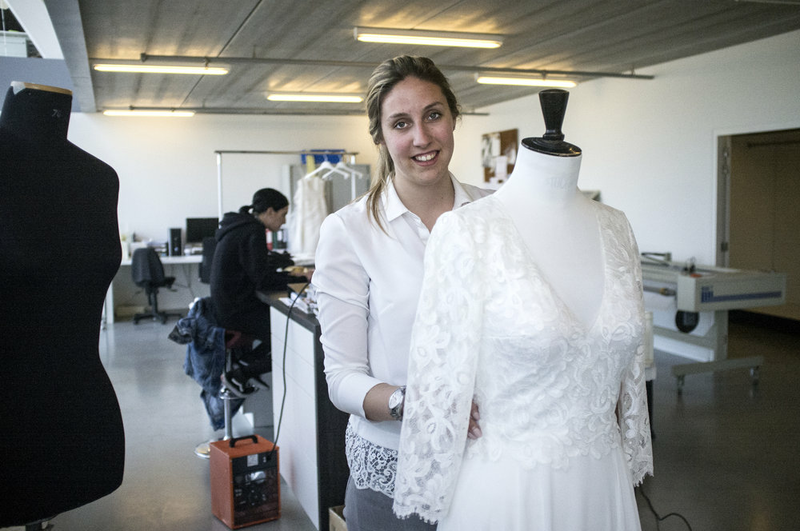 Two years in a row she took an internship at Marylise, a company specialized in the making of wedding dresses. “There is a very good atmosphere at our work environment. That’s very important to me. I think I wouldn’t be able to do my job and be motivated about it if the atmosphere was bad.” Read the complete story of Stien at Young Patterns’ blog.